In unique longitudinal clerkships, Feinberg students learn to provide primary care to vulnerable populations living in Chicago. Vineet Aggarwal was in his early days of medical school in the winter of 2017 when he first met Luis Reyes*, a patient who had long struggled with diabetes. Vineet Aggarwal, a third-year medical student, is in the ECMH program at Erie Foster Avenue Health Center. For most medical students across the country, such an encounter would typically take place during primary care clerkships that last four to six weeks, and a student would rarely see the same patient twice. 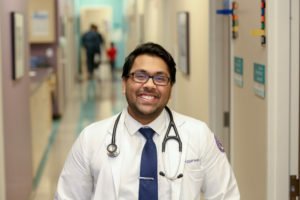 But as a student in Feinberg’s Education-Centered Medical Home (ECMH) program, Aggarwal was part of a primary care clerkship dedicated to creating continuity. In ECMH, medical students work with the same patients, peers and preceptor at one clinic over their entire four years of medical school. There, under the guidance of an attending physician, they experience what it truly means to provide primary care over the long run. And in many cases, they bring that care to the underserved patients living across Chicago who need it most. Reyes was a patient at Erie Foster Avenue Health Center, a federally qualified health center in Chicago’s diverse Albany Park neighborhood, where Aggarwal’s ECMH is located. A construction worker in his 20s, Reyes had lately been experiencing numbness in his extremities — a common complication of diabetes — that was affecting his ability to work. Though he longed to get his diabetes under control, he struggled to eat healthily and consistently take his medications. His A1C level, which measures a patient’s average blood sugar over three months, was exceeding 9 — a worrisome number indicating an increased risk of complications. When Aggarwal asked Reyes if he would be interested in follow-up health coaching — which students offer as part of the ECMH program — Reyes was receptive. Aggarwal began calling Reyes at least once a month, finding 10 or 15 minutes between classes to check in with him. They discussed meal and exercise plans, strategies for remembering to take insulin and Aggarwal provided gentle reminders about logging daily blood sugars and making follow-up appointments. Over the course of a year and a half, while also continuing to meet with Reyes in the clinic with his preceptor, Aggarwal’s impact became evident. Reyes saw his symptoms substantially improve, and lab results mirrored how he felt. His A1C level eventually fell from more than 9 to 7.6. Miranda Hart, ’12 MD, ’15 GME, health system clinician, is Aggarwal’s ECMH preceptor. 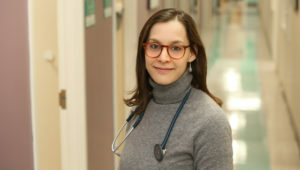 “That is a remarkable improvement — and it’s really a testament to the attention Vineet gave that patient, and the additional resource that students in ECMH can provide,” says Miranda Hart, ’12 MD, ’15 GME, health system clinician in Feinberg’s Department of Medicine, Division of General Internal Medicine and Geriatrics, and the ECMH preceptor at Erie Foster Avenue. Aggarwal, now in his third year of medical school, continues to see patients like Reyes when he attends his ECMH every Thursday afternoon. Experiences like his are transformative not only for patients, but for preceptors and students alike. ECMH began as a pilot program in 2011, the brainchild of Daniel Evans, ’00 MD, ’03 GME, a primary care physician and educator frustrated with the lack of continuity in traditional rotations. “The beauty of primary care is incremental care, therapeutic relationships and getting to become partners with your patients over the course of years — and most medical students never saw that,” explains Evans, now course director of ECMH, along with Jennifer Bierman, MD, both assistant professors of Medicine in General Internal Medicine and Geriatrics. ECMH was founded with the goal of continuity — but also on the conviction that students should experience primary care in a variety of settings. By working in clinics throughout Chicago, students deliver primary care to diverse patient populations, while also gaining a better understanding of complex chronic conditions and the range of factors that can affect one’s health. As such, Feinberg’s ECMHs are housed in a range of sites throughout Chicago, from Northwestern’s own academic medical campus, to community clinics in neighborhoods north, west and south of downtown, like Albany Park, Austin and Humboldt Park. About half of students in ECMH are at clinics in primary care shortage communities, but an estimated two-thirds of all ECMH patients are underserved, underinsured or medically vulnerable. Whether at clinics on campus or off, the ECMH model — and students’ role in caring for patients — is the same. An ECMH consists of a close-knit team of 16 students (four from each year of medical school) embedded into existing primary care practices, where they work under the leadership of a faculty physician for one afternoon per week. 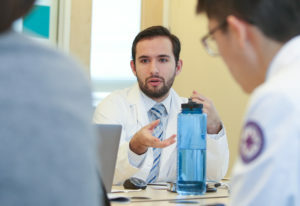 Senior students are paired with first- and second-years, who team up when meeting with patients in the clinic, presenting histories and discussing care decisions with their preceptor. And for patients with chronic conditions who might need extra support, students offer to maintain contact throughout the year as a health coach, as Aggarwal did for Reyes. What began as three pilot sites in 2011 has since grown to more than 20 ECMHs — an expansion fueled by the impact seen not only on medical education but on care for patients around Chicago. Students in ECMH meet to discuss patient cases. “I hear story after story about powerful patient interactions where students have been working with the same vulnerable patient for two or three years and have really advocated for them — whether it’s calling them to come in for a follow-up for depression or counseling a patient who quit tobacco,” Evans says. Beyond positive feedback from individual patients, research has also found improved outcomes, including higher rates of cancer screening and flu shots among ECMH patients. For students, surveys have shown that they prefer ECMH over traditional clerkships, finding gratification in caring for diverse patient populations over the long term, as well as in building close relationships with their team. The ECMH model may also have an impact on strengthening primary care in more comprehensive ways, such as mitigating burnout among attendings at the clinic, who find it rewarding to work with a group of enthusiastic students, and serving as a pipeline to inspire more future physicians to work with underserved populations. As a result, the goal is now to grow the program to 36 sites, which would allow every Feinberg student the opportunity to participate in ECMH — and to bring transformative primary care to more patients throughout Chicago. Expansion of ECMH would not have been possible without the support of Posh Charles, vice president of Community Affairs for Northwestern Medicine, Robert Havey, ’80 MD, ’83 GME, of the Global Health Initiative and other partners — plus faculty dedicated to primary care education and caring for the community.